In my previous post, I presented an interpretation of Amália’s ‘Lágrima’ based on a move from what I called the studium of the song text to the punctum of the anguished performance. In a more recent version of ‘Lágrima’ by Jorge Fernando and Argentina Santos there is an even clearer example of such a move. Following a verse sung movingly but not dramatically by Fernando, a studium is set up of melancholic meditation on hurt and loss (fado’s bedrock, we might say). The entry of Argentina Santos’s vocal into this studium shatters (cuts) the ‘stillness’ of the preceding moments. Through her vocalizing, from the anguished cry of ‘se considero’ to the almost whispered final ‘uma lágrima’, Santos creates these puncta via stark contrasts with the surrounding song text. Fernando’s verse and the oboe/cello part create a ‘safe’ space of sadness. Santos’s voice, in its urgency and extremity, destroys this place and reminds us of the ‘real’ pain at the heart of the lyric. This echoes the contrast implicit in the verse structure where a fragmented line is offset against a developed line, the former containing the fetishized object (the immediate thought, the attempt, however doomed, at freedom from language), the latter the interpreted (Symbolic) meaning of the thought. The fact that Fernando and Santos take ownership of ‘Lágrima’ in the way they do is important in terms of thinking about the fado ‘family tree’, a term which can be understood to relate both to the varieties of fado derived from the basic core of fado corrido, fado mouraria and fado menor, and to the symbolic lineage of fado performers through the years. In this case there is the association of Argentina Santos with a school of singers contemporaneous with Amália Rodrigues – though it should be noted that Santos, like many of her contemporaries, did not tend to be as adventurous as Rodrigues with the material she chose to sing, sticking to a far more ‘traditional’ repertoire. Jorge Fernando was a guitarist for Amália Rodrigues during the final part of her career before going on to release albums made up of his own material alongside work by other fadistas and to produce and play on Mariza’s first album, also contributing three songs to it (‘Chuva’, ‘Terra d’Água’ and ‘Oxalá’). Fernando, who also had a career as a pop singer-songwriter, played a major role in Ana Moura’s career as arranger, producer and songwriter. Like Paulo de Carvalho, Fernando acts as a bridge both between the old generation and the new and between pop and fado. Prior to the Fernando/Santos recording of ‘Lágrima’, the song had appeared on other fado albums of the 1990s. Dulce Pontes recorded a version on Lágrimas (1993), an album that highlighted the sense of fusion that would come to determine much of novo fado. Emphasizing the notion of a ‘family tree’, Pontes prominently placed a genealogy on the album cover that stated: ‘Father – Zeca [José] Afonso; Mother – Amália Rodrigues; Grandparent – Portuguese folklore; Cousins – Bulgarian folklore, Arabic music’. The instrumentation on the album consisted of the classic fado accompaniment (viola, guitarra) but, with the addition of vocoder, Fairlight synthesizer, electric guitar, piano and orchestra, this was a clear departure from fado norms. The song selection was evidence that, with the passing of time, the strands of folk and fado that had seemed so antithetical to each other in the post-revolutionary era could now be brought together in a useful synthesis: half of the album’s songs were ones associated with Amália Rodrigues, the other half with José Afonso. The mixture proved successful and the album has remained a constant seller nationally and internationally since its release in late 1993, judging by its perennial availability in European record shops such as Fnac, Valentim de Carvalho, and HMV. The appeal of Pontes’s voice seems to lie in its clarity and consistency and she has adopted a register that sits easily within a range of western popular musical styles, as is noticeable on her 2003 collaboration with Ennio Morricone, Focus, where she provides vocals in Portuguese, English, Spanish and Italian to the familiar tunes of various Morricone soundtracks. As a consequence her music is arguably less subcultural than that of, say, Argentina Santos, a difference that can be read into Pontes’s rendition of ‘Lágrima’ on the 1993 album. This track, along with a version of Amália’s ‘Estranha Forma de Vida’, were recorded live in the studio, presumably to catch the feel of an ‘authentic’ fado performance. Yet, without the ‘grain’ and anguish that Amália and Santos bring to their renditions, the song emerges as ‘merely’ beautiful, somehow missing the cathartic elements of the older fadistas’ versions. In Lacanian terms, there is less a fencing-off of the Thing than an unwillingness to go anywhere close to it; in Barthesian terms, there is an excess of pheno-song and a lack of geno-song, a studium with no punctum. The traumatic potential of ‘Lágrima’ is here elided in a move that maintains the performance firmly within the Symbolic Order, a kind of sanitized mourning that is also to be found ten years later in the song ‘Amália por Amor’ on Focus. Mísia, for her part, chose to revisit the song on her 2001 album Ritual, having already recorded a version for her second album in 1993. Where the earlier version, like Pontes’s from the same year, was fairly understated, the second presentation of the song utilized a style not dissimilar to that of Argentina Santos, stressing extremities of vocalization and putting particular emphasis on the key lyrical points discussed earlier. Mário Jorge Torres, in his liner notes to the CD, suggested this ‘new intensity and intentionality’ was due to the song’s inclusion in what was clearly a project inspired by the recent death of Amália. The musical arrangements and guitarra accompaniment are provided by Carlos Gonçalves, who had been Amália’s composer and accompanist during the last stage of her career and had composed the music to ‘Lágrima’. Like Jorge Fernando, Gonçalves here becomes a bridge between the old and new worlds of fado, providing new compositions for Mísia, such as that for ‘Xaile de Silêncio’, a poem sent to Mísia on the occasion of Amália’s death. In addition to these tracks, Amália is referenced by the inclusion of two songs that seek to extend the late singer’s legacy through the addition of new elements. ‘Mistério Lunar’ is a modern poem put to music written by the famous guitarrista Armandinho that Amália had sung with different words as ‘Fado Mayer’ in the 1950s. ‘Vivendo sem Mim’ is a poem written by Rodrigues, published in Versos but not recorded by her; here, it is put to music by Mário Pacheco and performed by Mísia and the pianist Christian Boissel in a move designed to evoke the way Amália rehearsed with Alain Oulman at the piano. By thus adding words to an ‘Amália’ tune and music to Amália’s words, Mísia suggests the ways in which this dialogic ‘ritual’ might proceed. The ritual extended beyond the song texts to the recording process too, with the use of valve microphones and single takes to emulate recording practices of the 1940s and 1950s. In considering the song I am drawing upon ideas articulated by Jacques Lacan and Roland Barthes. I do so partly because these thinkers provide a useful vocabulary to attach to the expression of grief and partly because I wish to situate this exemplary instance of fado practice within the wider theories explored in Fado and the Place of Longing. Lacan, in his commitment to Freud, provides a useful connection to theories of mourning, remembering and working-through. Barthes, meanwhile, offers a vocabulary which is explicitly derived from the analysis of texts, whether written, visual or aural. Here, I find his theories of the visual field – as set out in his late work on photography, Camera Lucida – as relevant as his comments on music. Lacan and Barthes are quite different thinkers with divergent agendas, but their theories do overlap at important places. For Lacan, the ‘Symbolic Order’ is that represented by society’s attempts to impose logic, structure and consistency upon the inconstant qualities of nature, a process carried out first and foremost through language. Against this is posited the ‘Imaginary’, those aspects of the subject’s quest for a wholeness that is always unattainable but always desired, as in the ‘Mirror Stage’ of Lacanian theory. The third Order, the ‘Real’, is that which cannot be symbolised and which exists beyond our attempts to explain inconstant nature. It is inconstant nature itself, which yet, paradoxically, always ‘comes back to the same place’. The Real is that which irrupts into the Symbolic as trauma. Its connections with trauma, jouissance and death distinguish it from the more comforting Imaginary. The writings of Barthes that I invoke here are those in which we find a breaking through of one (often ecstatic) mode of signifying into another, a rupture in the Symbolic Order that calls to mind the momentary glimpse of the Lacanian Real. The major examples of this type of Barthesian thinking are the concepts of plaisir and jouissance, of the geno- and pheno-song, and of the studium and punctum of the photographic image. What is notable about the lyric of ‘Lágrima’ is what it has to say about absence, how, for the vocal subject, the object of desire does not exist because of a refusal to recognize her. The subject posits a possibility for the object of desire to exist by hypothesizing a recognition – the recognition that the object of desire will mourn her after her passing – that will in turn betray a desire, the object’s hitherto hidden desire for her. The price to be paid for this bringing-into-being of the object and the object’s desire is, here, the subject’s ceasing-to-be, her death. What are the ‘pleasures’ suggested in the song? Or, rather, what are the signs of what Lacan calls ‘the pleasure of desiring, or, more precisely, the pleasure of experiencing unpleasure’? In short: despair, unrequited love, the dream-world and death. What is moving and pleasurable for the listener are the lengths to which this subject will go to achieve that jouissance which, Lacan reminds us, is in actuality suffering and pain. What is the significance, in Lacanian terms, of the subject’s inability to perceive herself as fully constituted, or rather to see herself as constituted around a lack which she can only resolve by propelling herself from the Imaginary of fantasy to the Real of death? Or should one read the song less literally, as a song about the giving-up of oneself to the Other, an ‘inevitable’ love sacrifice or coming-into-symbolic-being? What is engaged in these works is, much more than a musical style, a practical reflection (if one may put it like that) on the language; there is a progressive movement from the language to the poem, from the poem to the song and from the song to its performance. Which means that the mélodie has little to do with the history of music and much with the theory of the text. Applying Barthes’s notions of studium and punctum to ‘Lágrima’, we can attempt to sonorize these occularcentic figurations in an attempt to construct a theory of listening. For Barthes the studium is the cultural ‘participat[ion] in the figures, the faces, the gestures, the settings, the actions’, while the punctum is the ‘element which rises from the scene, shoots out of it like an arrow, and pierces me’. In a sonorized version the studium is the song text, the instrumental, vocal and lyrical setting which, within a few short bars, confirms this as a typical fado, albeit of the modernized fado canção style. Into this text are then studded a number of puncta, which can be identified as follows: the first syllable of ‘penas’ in the first line, echoed in the repetitions of the word in the subsequent three lines; the third syllable of ‘desespero’ in the first line of second verse, again echoed; the interplay between ‘considero’ and ‘desespero’ in the third verse. The fourth verse holds back from delivering its punctum, waiting, according to standard fado practice, for the repeat of the final phrase; when it comes (and we can detect in that word’s double meaning an echo of Barthes’s idea that the voice ‘caresses, it grates, it cuts, it comes’), it does so as the entire phrase ‘que alegria me deixaria matar’. I interpret these as puncta mainly due to the vocal articulation audible at these points and with the repetitive pathos to be found in these over-emphasized words and phrases. While it would be possible to describe this process merely as a succession of emphases without resorting to Barthesian terms, I am keen to anticipate a connection established in Fado and the Place of Longing between photography and fado texts, as I believe that one of the things these texts do is to participate in an ongoing ‘study’ of Lisbon(ness), in which the oft-hymned city is both studium and stadium of memory. While ‘Lágrima’ makes no explicit mention of place, I would maintain that it inherits a sense of place due to numerous connections between text and context; the ‘Lisbonness’ of fado, here, is a state of mind which may be cognitively inaccurate but is mythologically and psychologically vital. The beautiful satisfies, Lacan argues, to the degree that it does, not by representing the real, nor by avoiding the drive, but instead by pointing to the lost real, while at the same time fencing-off any possibility that we might come too close to the Thing. Made objects offer a kind of satisfaction when the signifier encloses absence and at the same time offers pleasure. Lacan himself provides us with another metaphor of enclosure when he claims that ‘it is obviously because truth is not pretty to look at that beauty is, if not its splendor, then at least its envelope’. Going further, he says that the beautiful ‘stops us, but it also points in the direction of the field of destruction’ and, later, that ‘the appearance of beauty intimidates and stops desire’. Bearing this in mind, is it possible to think of fado as representing a safe (and beautiful) way of (re)encountering trauma, of encircling the Thing? As Nick Cave observes, ‘the peculiar magic of the Love Song … is that it endures where the object of the song does not.’ Fado provides a place (street, alleyway, museum, theatre, text, envelope) to (re)visit the traumatic. It is one of those musics that subscribes to the Aristotelian principle of catharsis, purgation and abreaction to which Lacan also refers. The single tear that the singer of ‘Lágrima’ desires is both the tear that will cleanse or purge and the tear (cut) that will rend. 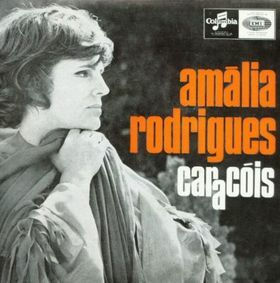 A glance through the part of Amália’s discography covering the years leading up to the Portuguese Revolution of 1974 reveals a bewildering array of material: fados (both castiços and canções), Portuguese folk songs, popular Lisbon marches, medieval poetry, French chansons, Italian and Spanish songs, Brazilian bossa nova, American show tunes, Christmas songs, and more. Throughout this period Amália remained steadfastly apolitical, though a number of her collaborators did not remain so distant; David Mourão-Ferreira, José Carlos Ary Dos Santos, Alexandre O’Neill and Manuel Alegre were all leftist poets who wrote works either specifically for her or which were requested by her or Alain Oulman to be sung in concerts and on recordings. It was Oulman who approached the exiled Manuel Alegre for permission to include his ‘Trova do Vento Que Passa’ [Ballad of the Wind That Passes], a piece associated with the anti-fascist movement, on the 1970 album Com Que Voz. The recordings put out under her name in 1974 are perhaps the most telling: a reissue of Mourão-Ferreira’s ‘Abandono’, now openly referred to by its alternative title ‘Fado Peniche’ in reference to the prison that had held many of the regime’s political prisoners (the song had been banned during Salazar’s rule); a single of Alegre’s ‘Meu Amor É Marinheiro’ which, with its cover photo of a navy recruit, played on the popularity of the armed forces following their role in the Revolution; a single of ‘Trova do Vento Que Passa’ backed by Mourão-Ferreira’s ‘Libertação’; and a version of Afonso’s ‘Grândola Vila Morena’. It was Amália’s simultaneous ability to court these poets while remaining free from the persecutions of the Estado Novo that came to infuriate many people and that still divides opinion on the singer now. For her critics, Amália’s political naivety smacked too much of the populism peddled by Salazar himself; this was hardly helped by the fact that fado and Amália had become synonymous and that, as fado now became tarred through association with the old regime, so, many felt, should its foremost proponent. This, allied to the sheer excitement of the new forms of music springing up in the wake of the canto de intervenção movement and imported Anglo-American rock music, helped to push fado out of the spotlight in the early days of democracy. Yet fado did not go away and neither did Amália, though her career took a definite downward turn within Portugal for a few years. It was during this period that Carlos do Carmo emerged as the new lantern bearer of fado. Less politically naive than Amália, Carmo brought a commitment to the ideas of the Revolution together with love, deep knowledge and experience of fado gained from his mother, the famous fadista Lucília do Carmo, and from the fado house he inherited from his father. Carmo worked frequently with the poet José Carlos Ary dos Santos and attempted, like Rodrigues and Afonso before him, to bridge the music of the city with that of the countryside. His most notable achievements in this respect were the albums Um Homem na Cidade (1977) and Um Homem no Pais (1983), built upon Santos’s lyrics. In such a process, the myth of the original career is amplified by the myth of the return. Each step of the comeback is charted as part of a legendary progression: years of glory, years in limbo, years of triumphant rebirth. The past is symbolically brought into the present, so that through the contemplation of Bacharach and his music … latter-day devotees can gain access to a realm of lost bliss. (Geoffrey O’Brien, Sonata for Jukebox: Pop Music, Memory, and the Imagined Life (New York: Counterpoint, 2004), pp. 8-9 – see also pp. 20-21 for the discussion of professional songwriters). Amália hardly endured ‘years in limbo’ but it was very much the case that the spectacular nature of her past ensured her a place in the public consciousness that not only outlasted the brief unpopularity she experienced in the mid 1970s but enabled her to be reborn in the ‘latter-day devotees’ who would pioneer the novo fado of the 1990s onwards. During the Estado Novo fado survived in a rather ambiguous position; as it became stationed – through successive laws prohibiting it from being sung in public houses – within the casas típicas which, through their nature, had the bourgeoisie and tourists as their public, fado lived alongside the regime, which, while not adopting or promoting fado, did not distance itself from it either. This did not matter overly since the problem was resolved by Amália. The quality of Amália’s voice and the moment in which it appeared allowed, to a certain extent, the definitive stylisation of fado, exporting it and bringing to bear upon it major ‘erudite’ poets, all of them now writing for a single voice. Leonor Lains makes a related point when she writes of Amália’s broad appeal: ‘She crossed all barriers and cultural prejudices. Amália had the gift of reconciling the urban with the rural, the cultured with the popular, through her unique quality of voice, full of sensual and musical emotion.’ Both de Brito’s and Lains’s points are relevant to another track from Busto, ‘Povo Que Lavas no Rio’ [You People Who Wash in the River]. The lyric, written by the poet Pedro Homem de Melo, works as both an evocation of rural values by a narrator who we assume to be a city dweller, or at least a person who has accepted a subject position that allows them to address the rural population with the familiar ‘tu’. The first verse begins with the lines ‘You people who wash in the river / Who cut with your axe / The planks of my coffin / There should be someone to defend you’. Subsequent verses speak of living among the people, of drinking from a cork cup and of the ‘scents of heather and mud’. Though there is an appeal to familiarity through a sense of belonging in the second and third verses, the distance maintained by the relationship described in the first is that which sets the underlying tone. Here the poet Homem de Melo and the singer Rodrigues take on the responsibility of hymning the people while also observing them at a geographical and temporal distance. The combination of romanticism and identification is one that aims for quite distinct audiences. Whether it is possible to find in Amália’s performance of the song the voice that de Brito tells us can resolve the problem of fado’s relationship to the Estado Novo is harder to gauge. Another way in which Amália was able to bridge the divide between urban and rural populations was her tendency to mix traditional folk songs of Portugal and the Lusophone world into her repertory of fados. 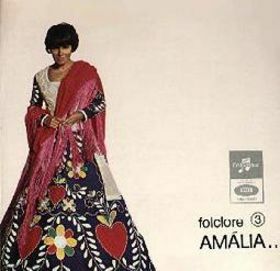 In 1967 Valentim de Carvalho released three EPs of folk songs: ‘Amália Canta Portugal’, ‘Malhão de Cinfães’ and ‘Folclore 3’. These were followed in 1971 by an LP, Amália Canta Portugal 2. The songs associated with this aspect of Amália’s work, such as ‘Caracóis’ or ‘Malhão de São Simão’, often used fado instrumentation but the vocal tended to be rather different to that generally found in fado singing – a difference that would no doubt be even more noticeable had Amália not been a fado singer by vocation. What Timothy Mitchell says of flamenco singing in relation to Spanish folk singing is comparable to the different use of emotional expression in fado and Portuguese folk singing: ‘the aesthetically differentiated moan of cante jondo can give the truth of the song style independent of the song lyrics, which do not even need to be intelligible; herein lies a crucial difference between deep song and Spanish folk song.’ It is worth remembering that lyrics are a crucial aspect of fado though it is also true, as in Mitchell’s point, that emotional melisma does much of the expressive work. In addition there are numerous examples of word fetishization in fado that shift the focus away from where it would be in a more narrative style ballad. Homem de Melo’s poeticized account of life in the countryside is quite removed from the narrative ballad style, stressing as it does the cork cup, the heather and the mud over any conventional storyline.It is interesting to speculate on the characteristic of the solo voice in fado canção, articulating as it often does a single highly poeticized viewpoint, and to ask what it says about the relationship between the individual and the collective. Certainly this type of song was considered by many fado aficionados to have little to do with the earlier fado, now coming to be known as fado castiço. Joaquim Pais de Brito stresses the links between fado’s origins and ideas of collectivity when he says of the fado world of the late nineteenth century, ‘it was an area where the excluded lived together: people from the street, immigrants, people without a past, people of mixed race, others who lived from the patronage of a decadent nobility.’ Music, and the venues in which it was created, brought people together in a way that, if less ritualized than in the villages, was nonetheless crucial in maintaining the social bond. For many, then, it was the subsequent journey fado took from the taverns to the theatre reviews that was responsible for erecting the wall between performer and audience, the fencing-off that, as in the museum and on the record, destroyed the possibility of a collectivized musical practice. It is at this same point that fado took on the responsibility of being the professional, ‘official’ Portuguese music of loss (or, as several fadologists would seem to prefer, the music of Portuguese loss, which is saying a rather different thing). Salazar’s policies undoubtedly exacerbated this process of fencing-off but did not create it. As with the emergence of rock ’n’ roll in the United States, there are a number of issues to consider when determining why fado canção emerged when it did and why Amália Rodrigues became its paradigmatic performer, ranging from changes in the law (here, the Novo Estado policies were crucially determinant but previously extant copyright laws should not be forgotten, affecting as they do the role of the artist in the period of mass mediation); migration to the cities; changes in recording and media technology; shifts in the high/low divide in the arts. Whatever the purists thought, and despite (or because of?) the emphasis on the individual, Amália’s music remained popular throughout the 1960s. For three years running, from 1967 to 1969, she received the MIDEM award for the artist selling the most records in their country, a feat only equalled by the Beatles. The emerging protest song movement, the canto de intervenção, can be seen as a reaction to this dominance of the popular musical scene as much as to a perceived ideological impurity in fado. Many of the songwriters of canto de intervenção were also, in a way, more individualistic than the fado performers they sought to challenge. As with contemporaneous folk music movements in other countries there was, despite a strong desire to identify with the common man and woman, a tendency towards solo singer-songwriters keen to put their message across their way. The singer-songwriter, like the preacher, requires a charismatic individuality in order to be effective; at the same time they require a compliant congregation willing and able to take their message up and echo it with the power of choral unison. It was in his ability to do so that José Afonso took on the mantle of the musician of the revolutionary era in Portugal. The connection between Amália and the themes outlined in these posts is hopefully clear. On the one hand, there is her life and career, which can be quite easily presented in terms of melancholy and loss. This is not quite the path want to take, but that is not because I have a particular problem with such an approach. On the contrary, while the conflation of life and art is often a problem in the discussion of popular music, I do not see how it is possible to avoid such a process when dealing with performers who have explicitly connected the two. Some of this approach will certainly seep through my account of Amália, but I mainly want to use her career as a way to describe the fado world with which I deal in Fado and the Place of Longing, a world constructed from the tangled relations between authenticity, innovation and the culture industry. Amália Rodrigues remains the single most paradigmatic performer in modern Portuguese musical culture for a number of reasons. Her career spanned a crucial period of change in Portugal and in the recording industry worldwide. Filipe La Féria summarizes these connections as follows: ‘Amália Rodrigues was born in the First Republic, lived with and for the Estado Novo and lived to see the 25 April Revolution. This can be seen as a very rich period and one that had a strong emotional effect on people.’ La Féria, the creator of an enormously popular musical based on her life and times, attributes the success of the show to the combination of a celebrity with whom the audience are able to identify and her negotiation of a history they too have either lived through or recently inherited. This identification is furthered in Amália’s own work, which manages, from early on in her career, to define a star persona based on a number of fado mythemes. Her biographical details resound with references to poverty, to the Mouraria, to singing on the streets while selling fruit, to being discovered in the fado houses and wooed into the world of professional performance and recording, and, ultimately, to living her life in a fog of saudade and permanent unhappiness which no amount of success or fame could shift. The extent to which the development of this persona was deliberate or accidental seems to matter less than the place she came to occupy in the Portuguese imagination. By the time Amália took on the role of Maria Severa in a 1955 Lisbon production of Júlio Dantas’s play, she had already surpassed that early fadista in terms of myth and prominence, due mainly to the success she had achieved internationally. While fado had hardly been unknown outside Portugal previously, it had never reached the level of exposure given it by Amália. Now an international star, she found herself being offered ever increasing opportunities, from performances worldwide to cinema roles nationally and in France. She had also demonstrated a strong desire to explore beyond the limits of traditional fado. It had become increasingly popular for fado singers in the 1940s to move away from the rigidly structured verses of the earlier period towards a freer style based on the work of contemporary poets such as Frederico de Brito. In addition to these newer styles of fado canção, Amália recorded other non-fado and folk songs, as well as Spanish flamenco, Mexican rancheras, and French, English and Italian versions of Portuguese songs (most famously ‘Coimbra’, released in an Italian version under the same title and refashioned as ‘Avril au Portugal’ and ‘April in Portugal’ elsewhere). This explorative aspect of Amália’s approach to her music encouraged musicians and songwriters to approach her with new ideas and led to collaborations that were to have an enormous impact on the direction fado would take. On the musical side it is generally agreed, and was frequently admitted by Amália herself, that it was the collaboration with the pianist and composer Alain Oulman which brought about the most far-reaching revolution in her fado style. What Oulman brought to Amália’s work was an ability to break free of established fado styles though a sophisticated musical language, while maintaining a strong link with the essential elements that kept the music recognizable as fado. Amália would rehearse with Oulman at the piano and he would occasionally accompany her on her recordings alongside the time-honoured guitarra and viola. Oulman’s arrangements allowed a greater variety of poetic styles to be utilized for fado lyrics, a development first brought to the public’s attention on the 1962 album Asas Fechadas, popularly known as Busto after the bust of Amália which adorned the cover. Of the nine tracks on the album seven have music written by Oulman. The lyrics are provided by Rodrigues herself (the famous ‘Estranha Forma de Vida’) and by the poets Luís de Macedo, Pedro Homem de Melo and, mostly, David Mourão-Ferreira, whose 1960 collection À Guitarra e à Viola had been dedicated to Amália and contained the verses for ‘Aves Agoirentas’ ‘Madrugada de Alfama’, ‘Maria Lisboa’ and the political fado ‘Abandono’, all included on Busto. Rodrigues and Oulman also collaborated on the work of less contemporary poets; 1965 saw the release of the EP ‘Amália Canta Camões’ and the album Fado Português, the former containing three adaptations of Portugal’s national poet, the latter harbouring one of the Camões pieces, as well as a cantiga de amigo credited to the medieval troubadour Mendinho, and the title song based on José Régio’s poem, alongside work by Mourão-Ferreira, Homem de Melo and Macedo. The fatalism of fado is easily located in this song about an uncontrollable heart, along with a sense of estrangement or disquiet, most notable perhaps in the line about living lost among the people. The lyric was coupled with music by Alfredo Marceneiro, the leading fadista of the pre-Amália period and, as with most Marceneiro compositions, the melody is relatively simple. The significance of the track lies predominantly in the bringing together of these two major figures of twentieth century fado, an event whose importance is underlined by the song’s appearance on Busto alongside the work of Mourão-Ferreira and Oulman, and in the way that the song, alongside Alberto Janes’s ‘Foi Deus’, became an autobiographical marker – what Roland Barthes might call a ‘biographeme’ – of Amália herself. With no effort, [Funes] had learned English, French, Portuguese and Latin. I suspect, however, that he was not very capable of thought. To think is to forget differences, generalize, make abstractions. In the teeming world of Funes, there were only details, almost immediate in their presence. While it is necessary to recognize these points, they do not make the obsession with memory and loss disappear; in this sense, at least, loss cannot be lost, for forgetting, like remembering, is only ever partial (making it both partial and endless). This is what brings about haunting, the spectral permanence of the past in the present. Although the various thinkers I have mentioned have different notions of the politics of memory, they all share an obsession with remembering and all, we might add, have strong ideas about what they want memory work to be. [T]he collective frameworks of memory are not constructed after the fact by the combination of individual recollections; nor are they empty forms where recollections coming from elsewhere would insert themselves. Collective frameworks are, to the contrary, precisely the instruments used by the collective memory to reconstruct an image of the past which is in accord, in each epoch, with the predominant thoughts of the society. Things tumble with increasing rapidity into an irretrievable past. They vanish from sight, or so it is generally believed. The equilibrium between the present and the past is disrupted. What was left of experience, still lived in the warmth of tradition, in the silence of custom, in the repetition of the ancestral, has been swept away by a surge of deeply historical sensibility. Our consciousness is shaped by a sense that everything is over and done with, that something long since begun is now complete. Memory is constantly on our lips because it no longer exists. I remember the first time I saw television. Lucille Ball was taking ballet lessons. I remember the day John Kennedy was shot. I remember that for my fifth birthday all I wanted was an off-one-shoulder black satin evening gown. I got it. And I wore it to my birthday party. The originality in Brainard’s technique lies in the intermingling of personal and collective memories and in the recognition that the catalogue of human life as compiled by memory is made up equally of intense personal experiences, public events, fads, fashions and myths. Brainard’s work shows how each person simultaneously carries within them official and unofficial histories, the contents of which are always at varying stages of being recalled or forgotten. The Kennedy assassination, for example, is an event unlikely to be forgotten in either official history or the unofficial history of a certain group of people alive at a particular time and in at least some level of connection via mass media with the rest of the world (Brainard’s generation, in other words). Indeed, for such a group, whose hegemony over these matters is only recently beginning to wane, this event has become the classic example of such individualized-yet-shared memory, with people being said to know exactly where they were when they heard the news of the president’s murder. In the new millennium this event has been succeeded for many by the events of September 11 2001. Yet if these events are subject to both official and unofficial memory, highly personal recollections such as those collated by Brainard still have within them a quality that is transferable to others who have experienced something comparable or who can connect to them simply through the fact that they too have remembered (things). Indeed it might well be said that it is in the highly personal, idiosyncratic details (Brainard’s evening gown) that the possibility for a universal recognition resides. Adair’s conflation of the work of Barthes and Perec serves as an intriguing invitation to think about the concept of mythology alongside that of memory. This has been a strategy taken up by a number of historians in recent years, especially those concerned with memory’s associations with place. Prominent amongst these have been Raphael Samuel and Pierre Nora. Samuel’s ‘theatres of memory’ and Nora’s lieux de mémoire are both influenced by the work of Frances Yates, whose exploration of ‘the art of memory’ relies on notions of myth and place, yet there is an equally important role played by repetition – indeed, memory thought of as an art is born of the desire to be able to repeat. In this sense, it is interesting to note a connection between these historians and the work of the ‘memorians’ of the ‘I remember’ school. In the latter we find a recourse to a ritualistic process (anamnesis, recollection) grounded in the repeated act; this repetition is continued in the representation of memory as these writers follow the unchanging mantra of ‘I remember…’. This is a device often used in popular songs, where memories are listed over various verses. Fado is no exception, containing a number of such songs. Katia Guerreiro’s ‘Romper Madrugadas’, for example, provides a verse form built upon lines that begin with the word ‘recordo’ [I remember]: ‘Recordo os segredos das noites da bruma / Recordo os teus dedos bebidos de espuma / Recordo o teu cheiro de amor perfumado / Tristeza em sorriso num corpo rasgado’ [I remember the secrets of the nights of mist / I remember your fingers dipped in foam / I remember your smell of fragrant love]. From an earlier point in the twentieth century, we might look to Alfredo Marceneiro’s ‘Lembro-Me de Ti’, each verse of which begins with the line ‘I remember you’ and carries with it another memory. With seven verses and a running time of nearly six minutes the overall effect is one of extended ritual punctuated and regulated by the highly emotional lilt given to the title line by Marceneiro. Indeed the song is straining with emotion, Marceneiro’s voice sounding as though it might break under the force of the memory and giving the song an emphatically nostalgic air. The ‘tinha’ (‘I had’) that begins each line of the first three verses of the song (the first is not quoted above) and that is multiplied in Amália’s performance by the repetition of the last two lines of each verse, produces a litanistic quality that hints, even though it is not stated explicitly, that these things have been lost forever. The final verse seals this assumption with the confession that the singer used to like being who she was, with the concomitant suggestion that she no longer does. The potential infinitude of memory work suggests that there is little that is not worth remembering. Noting the ‘acceleration of history’, Pierre Nora writes, ‘Everything is historical, everything is worth remembering, and everything belongs to our memory.’ Accompanying history’s acceleration we find an acceleration of chroniclers and rememberers, both amateur and professional, a process that has been immeasurably widened by the invention and development of the internet. To take a couple of recent web-based developments in the growing ubiquity of chronicling and remembering, there has been an explosion in the amount of ‘encyclopaedic’ information available (most notable in the phenomenon of Wikipedia) and of personal archives (blogs), many of which contain both autobiographical information and theoretical explication or discussion of wider issues. It was perhaps inevitable that the project initiated by Brainard and developed by Perec and Adair would find its modus operandi continued via the medium of the internet with ‘I remember’ blogs. (See also Zeina Abirached’s comic book, Je me souviens: Beyrouth (sample pages here)).